Now, New Pampers with magic gel can absorb quicker and hence keep the skin dry for upto 10 hours. So your baby's skin will be dry throughout the night, and give him a peaceful, undisturbed golden sleep. Your baby will drift into a sound sleep at night with the perfect care offered by the Pampers diapers. Its cotton-like softness offers soft comfort to your baby's skin and prevents friction rashes. 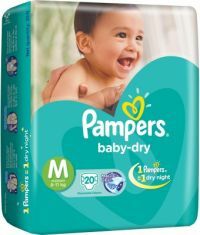 With their adhesive side tapes, these Pampers medium size diapers fit well and can be fastened again after you ensure that the diaper is still dry. Its extra dry layer features Magic gel that absorbs up to 6 glasses of fluid effectively from the surface of the diaper and protects your baby's delicate skin from wet rash and irritation. Offering up to 10 hours of dryness, this is one of the best baby diaper that keeps your baby's skin fresh and supple all through the day. 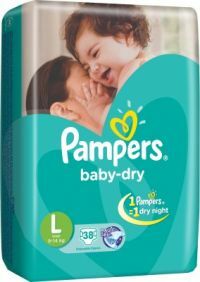 With a thin and lightweight design, this Pampers baby diaper helps your baby move around with ease. It is a great choice when you have to dress your baby for parties or outings, as it's comfortable to wear and easily fits under the clothing. The top layer of this baby diaper is infused with baby lotion, which keeps your baby's skin moisturized at all times. With the goodness of Aloe Vera, this lotion nourishes your baby's delicate skin by providing a water-repellent protective layer and prevents diaper rash, inflammation and irritation. With ease of movement, nourishment and protection, these Pampers baby dry diapers help keep your baby cheerful and active for a long time. 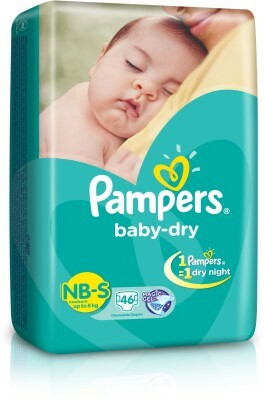 To Recieve updates and possible rewards for Pampers Baby Dry Diapers Small Size please sign in. To Recieve updates and possible rewards for Diapers & Nappies please sign in.